PORT OF SPAIN, Apr 26 2017 (IPS) - As two environmental activist groups in Trinidad and Tobago powered by young volunteers prepare to ramp up their climate change and sustainability activism, they are also contemplating their own sustainability and how they can become viable over the long-term. IAMovement and New Fire Festival both began their environmental activism in earnest less than three years ago. 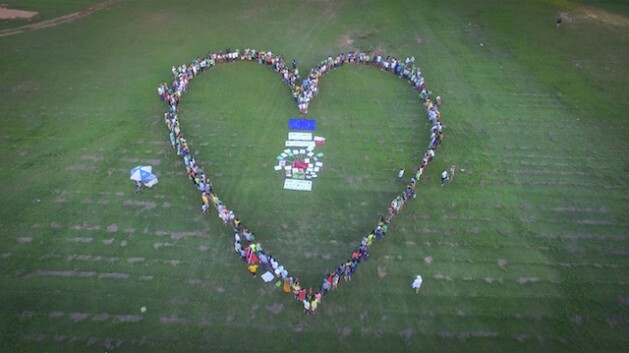 IAMovement captured the Trinidadian public’s imagination with its climate change march in 2014 and the iconic heart shape formed by 150 marchers who joined them, an emblem reprised by the 450 who joined IAMovement in 2015 in the country’s capital city of Port-of-Spain for the march that coincided with COP21 in Paris. For the group’s first event in 2014, timed to coincide with the rallies being held worldwide during UN climate talks in New York, “people came, interested, but not sure what to expect. But from the beginning the conversation was very positive about what we can do and the solutions available to us,” said IAMovement’s Managing Director Jonathan Barcant. New Fire Festival, run by the NGO T&T Bridge Initiative, began its engagement with climate change activism in 2016 with the launch of an ecologically sustainable music festival that emphasises reducing, reusing, and sustaining. This followed a successful run as organisers of an underground music festival designed to give more exposure to talented but marginalised artists and musicians. Since their launch, both organisations are seeing more and more young people rallying to their side and offering to work as volunteers. “We have had about 50 volunteers over the last three years, and we have a growing list of people who are interested [in volunteering],” Barcant said. Williams likewise said, “It’s really a small team of people who came together to make it happen. This generation is basically expecting, hoping, longing for something new to happen on our landscape. Many people said they had always dreamed of doing something like this or being part of it. A lot of it is volunteer work. This groundswell of support has incited New Fire Festival and IAMovement to want to move their organisations to another level, as they make ever more ambitious plans to engage with climate change activism and environmental sustainability issues. But to ensure the long-term viability of their organisations and their plans, they are interested in providing proper remuneration to those who work on their projects. “One reason we are restructuring is because we got so many requests to volunteer now, that I can finally say we have the capacity to do so,” Barcant said. IAMovement operates “as a full grassroots non-profit. This is the first year we are getting real funding where we can pay a project coordinator. In similar vein, Williams of New Fire Festival observed, “I do not get a salary from the organisation or from New Fire Festival. This year we have only managed to break even to cover our costs. Last year, we had to dip into our pockets. “Because it is a non-profit, even when the festival is eventually earning profits we will have an obligation to treat with that money a certain way. It’s not that we can pocket it or give to shareholders,” he said. For this reason, the NGO behind New Fire Festival is preparing to launch a for-profit enterprise using discarded shipping pallets to make fine furniture. IAMovement is raising revenue through donations on its Web site, funding from European embassies operating in Trinidad and Tobago, grants from multinational agencies, as well as crowdfunding to cover the cost of its environmental projects. The organisers of New Fire Festival are also interested in launching a business that would green events for event organisers. The year has begun on a high note for both organisations. IAMovement is in the process of hosting a series of 40 climate talks at schools and other venues, where their low-budget film on climate change, entitled “Small Change”, will be shown. The film was shown at the Trinidad and Tobago Film Festival last year and will be screened at other festivals, including the National Film Festival for Talented Youth, described as “one of the world’s largest and most influential festivals for emerging filmmakers.” It was created by IAMovement member, 23-year-old Dylon Quesnel. The film presents IAMovement’s argument that Trinidad and Tobago can derive major social and economic benefits by moving away from an economy based on fossil fuels to one based on renewable energy and care of the environment. IAMovement will also be planting the country’s first edible roof on the Ministry of Education building, which was designed to accommodate such a project. New Fire Festival concluded the second edition of its annual festival early in April. The festival was held in the lush surroundings of Santa Cruz in Trinidad’s famous Northern Range and attracted approximately 2,000 paying visitors, nearly three times the attendance in 2016, its first year. At the festival, visitors were given access to workshops on eco-sustainability topics. They were also discouraged from entering the festival with disposable water bottles. “We do our best to avoid disposables. Even where we use disposable items they are compost-type items,” Williams said.